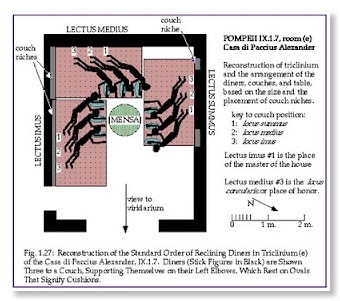 The triclinium, in all the better Roman homes, was the place around which the feasting and partying took place. Each wide lectus, or couch, held up to three people. For larger parties, more triclinia were provided. Dinners lay on their left side and reached up over the edge of their couch for the goodies placed before them by the dining room slaves. You can see from this diagram that there was a definite pecking order as to who reclined where. The 'seating' arrangement tried to honor the most important guests while at the same time promoting harmony and lively conversation.